On Coming Out In Your Mid-Twenties. I recently overheard two fellow students talking before a seminar. We were out drinking all night with a friend. His girlfriend left him because she realized she’s a lesbian. He’s gutted. Sounds like an excuse. Who realizes this late on that they’re gay? I felt like stepping in and saying something. Like, uh, me? I hastily swallowed my chocolate brownie in preparation and promptly choked on a chocolate chip. Spluttering and hacking, I only managed to awkwardly raise my hand. The two girls looked at me blankly, the professor swept into the room and one of the girls lowered her head onto the desk in submission to her hangover, which was the end of that mini-outing. “A bit of column A, a bit of column B”: how I used to sum up my sexuality in a nutshell. If anyone asked, I said I was bi. It worked like this: my crushes, since forever — on women. My relationships thus far — with men. To my ex I said I fall in love with people and not with gender, which was not a lie but also not the whole truth. We picked out red-haired girls in crowds together and merrily went about imagining ourselves and each other kissing them. It was no stranger to us than our shared passion for eating food we couldn’t afford. I was happy and then I wasn’t, which did not mean I was not in love. I nevertheless regretfully passed up on connections and sparks and offers, and buried a different kind of love, a more painful one than the easy, often effortless variety I felt in my relationship. I suffered from indistinct internal aches after party kisses and three-second eye collisions on escalators. I also suffered from heart palpitations at the sight of certain naked kneecaps. At some point — up a mountain: sweaty, empty-headed, high on endorphins and pain — I realised I felt more affinity with Column A than I did for Column B, that the scales had tipped. I moved beyond falling painfully hard for women, and began falling also for the idea of women. The hair, the interplay of softness and hardness, the secret lives. The language and bodies. For several months after my epiphany I tried to make being gay and in a heterosexual relationship okay by brandishing the word polyamory before me like an amateur fencer with a saber — in an unwieldy fashion and with misplaced aggression — but after a while I found myself looking into the yellow eyes of my own cowardice. Regret morphed into impatience with, and then anger at myself, and I temporarily relinquished my smokescreen, the Saber of Polygamy. I am not fanatical about labels, especially when it comes to relationships — the concept of togetherness means something different to most people, and who knows if the hand-holding otters floating down rivers really even like each other — but after no inconsiderable heartbreak, a little soul-searching and a lot of fun, I am 1) wondering what exactly I was so scared of, and 2) proud of myself in the way I am usually only proud of other people. Revelling in my newfound okayness with my gayness is not the same as shouting it from the rooftops. “Have you come out yet?” I have been asked on several occasions. As though it is an event, something like a party or the flicking of a light switch* and BOOM: family and friends just KNOW. As though anybody would be surprised or even really care; as though it would make a fundamental difference to my personality. My answer on these occasions is yes. 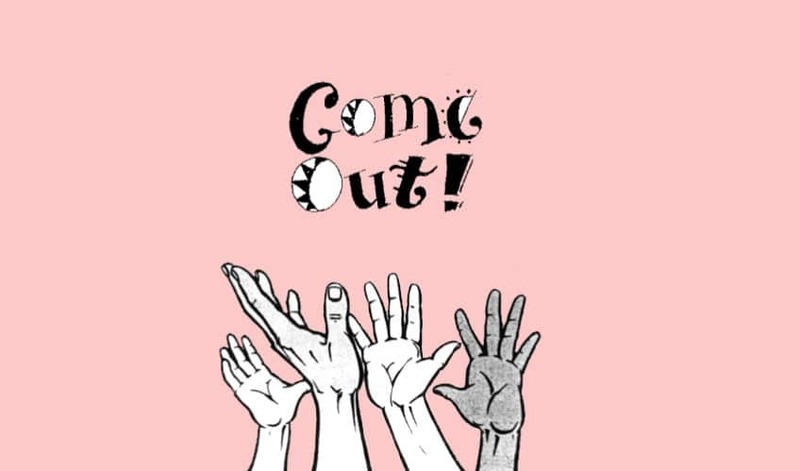 Yes, I have come out — to myself — and all other comings out are easy peasy in comparison. *When, in reality, (my) sexuality is not as black-and-white as light on or off, as staying in or coming out.